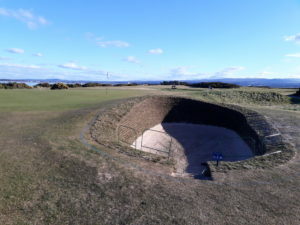 This is one of the bunkers very prone to sand blow and it took up a lot of our time having to re shape during dry and windy weather.  The depth of sand was also an issue leading to plugged balls when the sand dried out and the unpredictability of the recovery shot within. 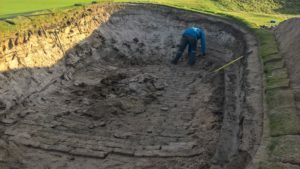 So much of the fine sand was dug out and the base re shaped with the use of old revets /turves before a fleece bunker mat was cut and pegged in. 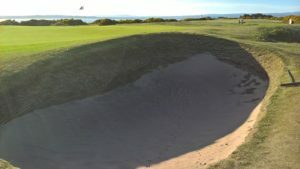 We added back in some fine sand and topped up with a 3” layer of new sand from Balachladich quarrie Muir of Ord. The new sand once settled and weathered in should offer a more consistent depth and firmness allowing a more predictable bunker shot. 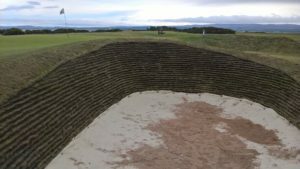 Like all of the turfing work it takes time to knit in and establish therefore we will hope to have all newly completed bunkers open around the middle of March.